As EB Awareness week is approaching, I always hear the “numbers” of EB being floated around. 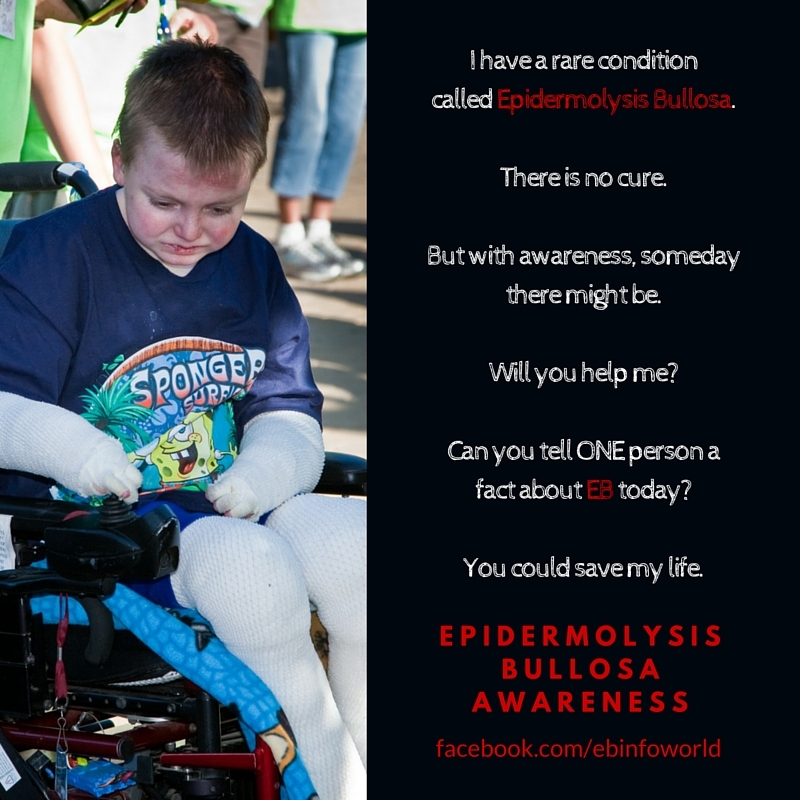 One official website states the incidence of EB is 1 out of every 20,000 births. Another official website states One in about 17,000 live births. Yet another official website states 1 in 50,000. The truth is, most likely nobody knows for “sure”. I am telling you this because I remember quite clearly a gal that was a waitress at an EB event who then went to the organizer to tell her afterwards that she thought she had EB, how her feet always blistered and nobody knew why. She later found out she indeed had EB. This happens because the genetics of EB are so unique and vary so much from patient to patient that the diagnose, especially in the more light forms, can be almost impossible to achieve unless you know what to look for. The simplex form, which is the form of EB which is most common, varies greatly, and while most patients diagnosed with EB fall into this category, there are many out there that never even get diagnosed. Then there is the whole discourse of the “live births” statistic. As I found out on my own child when Alex was stillborn, we didn’t know why he died, but it was evident after Nicky was born that Alex’s peeling skin was most likely associated with him also having EB. I wonder how many children with EB are miscarried or are stillborn? We’ll never know, of course, because they are not part of the statistic and the vast majority of them never get diagnosed. Even so, EB as a whole is rare, and when you hear these statistics thrown around, please do understand that the more severe cases, like the ones of my son Nicky, or those you might have seen in TV, such as Jonny Kennedy and others, all have a form of EB called “Recessive Dystrophic” (RD), whose instance is far, far less than 1 in thousands and much closer to 1 to 3 in millions. The more severe forms, which are the Junctional and RD are usually diagnosed right away because they tend to be so bad. Nicky was 12 hours old when the Dermatologist told me he had no doubt he had some form of EB. Nicky had gigantic blisters everywhere, one of which went from his armpit all the way down to the wrist! Can you imagine what that looked like and how scary that was? As a new mother I was shocked and numb. When we talk about the numbers with EB, it’s a more accurate statement to go by “form”. The more severe the more accurate the numbers. Sad, but true. On my ebinfoworld.com website I cite the most accurate numbers I could find, which are those from the EB registry. Upon Nicky’s diagnose I was called by the EB registry for him to be added, so this is why I say that the patients with the more severe forms get surely added, it’s basically automatic. It’s impossible to know how many of the milder forms are added though, especially if they do not even know they have EB like my waitress example above. According to the EB registry’s last report, which is probably at least 10 years old but I haven’t seen a more recent one, EB affects less than 10,000 children and adults in the United States. Most of these patients suffer from the Simplex form of EB (roughly 85% of all diagnosed with EB have Simplex), about 600 have the Junctional form, 600 have Recessive Dystrophic, 840 with Dominant Dystrophic and 320 with some unclassified form of EB. Simplex is more common for many reasons. For one, it is inherited dominantly, which means that if the parent has it, the child has a 50/50 chance of having it too. Also, with this form, the vast majority of patients go on and have normal lives and reproduce, which cannot be said with most or at the very least the bigger percentage of the patients diagnosed with RDEB or Junctional. Also, these last two forms are inherited recessively, which means both parents have to be carriers, which is another obstacle in becoming less rare. Which is a good thing. The rarer these severe forms the better. If you have 600 patients with RDEB and 600 with Junctional living in the US according to the Registry, and the United States population totals 320 million people, it means the incidence is roughly 2 in a million for each form. I was actually told by an EB doctor that the latest number was 3 in a million for RDEB but I am not sure where he got that number, so I will stick with the 2 in a million here as I move forward. We have roughly 4 million babies born every year in the United States, which means that 8 babies are born in the United States with RDEB and 8 with Junctional every year. Not even one per state per year. Heck, not even one for every other state per year. This is why when Doctors first see these babies with blisters they are shocked and do not know what to do and why I fight so damn hard for awareness. When Nicky was born, even though the Dermatologist that was brought over to diagnose my son was correct in guessing EB, he STILL did not tell the nurses or anyone at the hospital that was caring for my son in NICU that his blisters needed to be lanced. How crazy is this? this is “EB 101”. There is nothing more important in EB care than lancing the blisters. So, as EB awareness week is approaching the last week of October, remember this. Despite the low numbers or how rare this condition is, the pain ALL of them suffer is great. I will post one or two new graphics I made on my Facebook EB Info World page and if I can be so BOLD to ask everyone reading this to share just ONE on their facebook newsfeed, twitter, pinterest or anywhere you like, I would appreciate it immensely. We need a cure and we need it NOW!